Afridi acknowledges his century// Alvin Bagaya. CRICKET. Malaysia lost pinch hitter Anwar Arudin to Uganda’s unique strategy of opening with off spinner Frank Nsubuga but Virandeep Singh 39(81) took advantage of a spread field and some poor lines into his pads to score freely and build an innings recovery of 55 for the fourth wicket with innings top scorer Shafiq Sharif 58(55) to push Malaysia past 100. Malaysia almost got away with Captain Faiz Ahmed 17(46) being dropped without scoring but he never made the Cricket Cranes pay a heavy price. Sharif kept the scoreboard ticking before Frank Nsubuga returned to clean up the tail. Uganda’s openers continue to struggle at the tournament after they lost Hamu Kayondo early and Brian Masaba struggled to rotate strike. Neville Linayage picked Masaba and star batsman Roger Mukasa played on. The run chase looked shaky until Irfan Afridi was sent in with only one job: hit them big. Afridi took most of the strike and used it to take the Malaysian bowling apart with some brutal hitting. Ten sixes and 7 fours later he raised his bat to the raucous crowd as he soaked in the applause and relief of having scored his first List A century. 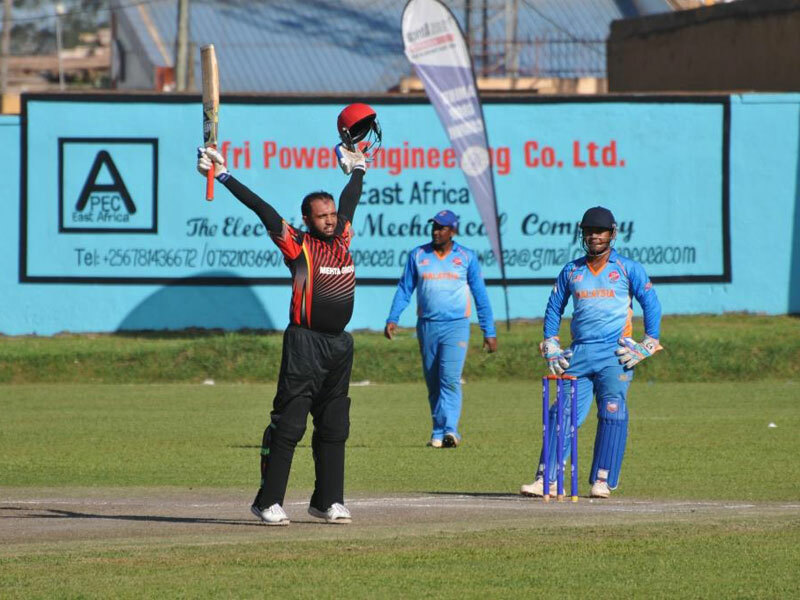 Roger Mukasa 15(36) put on 36 for the 4th wicket with Arnold Otwani 24(50) who remained positive despite the tight lines that the Malaysian bowlers kept. Neville Linayage and Muhammad Wafiq were giving nothing away so was left arm spinner Pavandeep Singh when he came into the attack, eventually bowling Roger. The tension built in the stands, in the dressing room and on the ground faster than the over rate could keep up when Irfan Afridi stepped on the wicket, his first shot was a big heave and he failed to score against Pavandeep for five balls. But when he eventually connected, clearing long on for six and clubbing him back to the sight screen for four, he was simply imperious. From then on, it was a display of some power hitting as he took on the returning Linayage, Khizar Hayat and Muhammad Wafiq, he went past 50 with a single down punched to long off in the 36th over of the run chase; and scored his maiden list A century clubbing Khizar Hayat for six over the sight screen in the 36th over, it was only fitting that the man of the moment knocked off the winning runs on ball 36.2 through covers for four. The table has flipped and Uganda springs from bottom to third place, the calculations and permutations are in high gear as everyone tries to find out who must chase what in how many to qualify. Cricket Cranes coach Steve Tikolo was in praise of Afridai. “It’s one of the few innings where I have seen someone bat the way he did. I remember it was 2002 when his cousin Shaheed Afridi also played a similar knock against Sri Lanka and it was very good to watch the way he went about it,” Tikolo said. Captain Davis Karashani said Afridi’s is the kind of performance one can have once in a lifetime. “Fortunately for us, that once in a lifetime was today. He literally just showed up and won the game for us,” Karashani said. His Malaysian counterpart Faiz was left ruing their failure to take out Afridi as early as possible, indicating that the team had done enough to win the game but for the big hitting batsman. “We batted well on this kind of wicket which is really low in the morning. 189 is a good score. If Afridi had gone earlier we would get through. Everyone is disappointed because we want to qualify. Now we need to show something for the next two games,” he said.